Mexican President-elect Andrés Manuel López Obrador has vowed to halt the import of gasoline and diesel from the United States and other countries by 2021. After a dramatic spike in gasoline prices incited widespread protests in Mexico last year, then-presidential candidate Andrés Manuel López Obrador made a promise that caught the attention of Texas officials and the state’s oil and gas industry: The veteran left-wing politician vowed, if elected, to halt the import of gasoline and diesel from the United States and other countries by 2021. 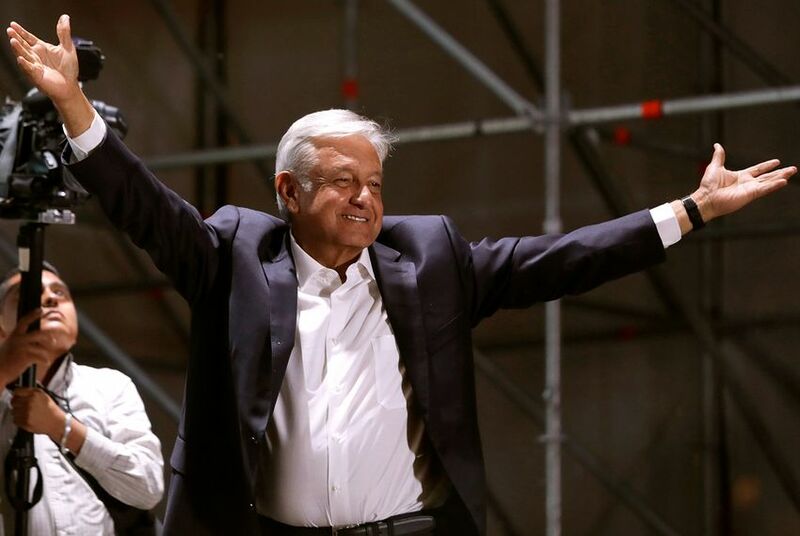 The promise — which López Obrador had previously mentioned and which he reiterated one week after winning in a historic landslide last month — was a key component of his national development platform in his third run for the presidency. During the race, he vowed to reverse policies pursued by his predecessor, Enrique Peña Nieto, that made the country more reliant on the international gasoline market prices. He told supporters it would result in cheaper and more dependable fuel. "Refineries will be built, gas extraction will be promoted, and the electric industry will be strengthened," López Obrador said in November 2016, more than a year and a half before the July 1 election. "All this to stop buying gasoline and other fuels abroad." Such a policy could have enormous implications for the Texas economy. The state’s refineries produce much of the gasoline and diesel imported to Mexico, where about three out of every five liters of gasoline consumed comes from the United States. But Texas’ energy regulators, industry groups and experts downplay the potential impacts, casting doubt on López Obrador’s ability to keep his promise — at least immediately. They say Mexico has a long way to go to wean itself off foreign fuel imports. And they also don’t see Mexico severing ties with a top trading partner. There’s a sense that López Obrador’s promise was more political than practical, said Steve Everley, managing director of FTI Consulting. Ultimately, he said, economics — and a strong and established trade relationship — will win out. López Obrador’s plan calls for the construction of a refinery in his home state of Tabasco in southeastern Mexico and the rehabilitation of six existing refineries to increase the amount of fuel they can produce. That would cost a combined $11.3 billion. Noel said Texas refineries could stand to benefit from increased Mexican energy production if it outpaces refinery construction, which may require the country to export fossil fuels to the United States for processing. Mexico currently only meets one-third of its fuel demand domestically, said Texas Railroad Commissioner Ryan Sitton. Last year, the Mexican market consumed 797,100 barrels of gasoline per day and 365,500 barrels per day of diesel, according to data from Pemex, Mexico's state-run oil company. Only 35 percent of that came from Mexican refineries. The U.S. Energy Information Administration doesn't keep track of how much of U.S. fuel exports to Mexico come from Texas refineries. However, Sitton — one of three elected officials who regulate the state’s oil and gas industry — said Texas refineries sell about 800,000 barrels of gasoline and diesel a day to Mexico, which would mean Texas provides Mexico with an overwhelming majority of its fuel. “It’s a pretty big shot," said Sitton. "That’s gasoline production from four or five large refineries." Asked a few days after the July 1 election about his ambitious three-year deadline to build a new refinery, López Obrador, who takes office Dec. 1, pointed out that India achieved a similar goal. That country's Jamnagar complex was able to nearly double its capacity to 1.2 million barrels per day between 2005 and 2008 by building a second refinery at a cost of $6 billion. Experts say refinery repairs could prove to be the fastest way for López Obrador to achieve his goal. "[Building] a refinery takes eight years to do well. A rehabilitation takes between 6 months and a year, costs much less and maybe can reach 60 percent capacity,” said Duncan Wood, director of the Mexico Institute at the Wilson Center in Washington, D.C.
Jorge Canavati, co-president of the International Affairs Committee at the San Antonio Hispanic Chamber of Commerce, said even if Mexico increases its production, market prices will ultimately dictate how much fuel it imports. "When Pemex was aggressively producing, Pemex also imported [gasoline]," he recalled. Last year started for Mexicans with a rise in gasoline prices of 20 percent, a situation that sparked a series of protests in January. Experts also say three years would be enough time for Texas refineries to find a new market for their products. With the lifting of a ban on most crude oil exports in 2015 and the enactment of various policies to boost natural gas exports, the United States is poised to become a top fossil fuel exporter to Asia and Europe. Susan Grissom, chief industry analyst at American Fuel and Petrochemical Manufacturers, scoffed at the idea that the loss of the Mexican market would have a big impact on the United States. “You know, the world adjusts,” she said. But it would be a major hole to fill. More than half of the gasoline the United States exported in 2017 went to Mexico, according to the Energy Information Administration. And Mexico has been increasing its imports in recent years due to refining problems. Pemex, which also oversees refining in Mexico, decreased its capacity to make gasoline in the first quarter of 2018 to 220,000 barrels per day. That’s compared to 421,000 barrels per day in 2014. Energy experts say domestic fuel production has dropped because Mexico has failed to invest in repairs to its aging refineries. Its last one was built more than 40 years ago. There are six refineries in total. Everley said no fuel export market more sense for the United States — and Texas — than Mexico. Disclosure: Texas Tech University has been a financial supporter of The Texas Tribune, a nonprofit, nonpartisan news organization that is funded in part by donations from members, foundations and corporate sponsors. Financial supporters play no role in the Tribune's journalism. Find a complete list of them here. Hey, Texplainer: How does Texas' budget use taxes from oil and natural gas production?